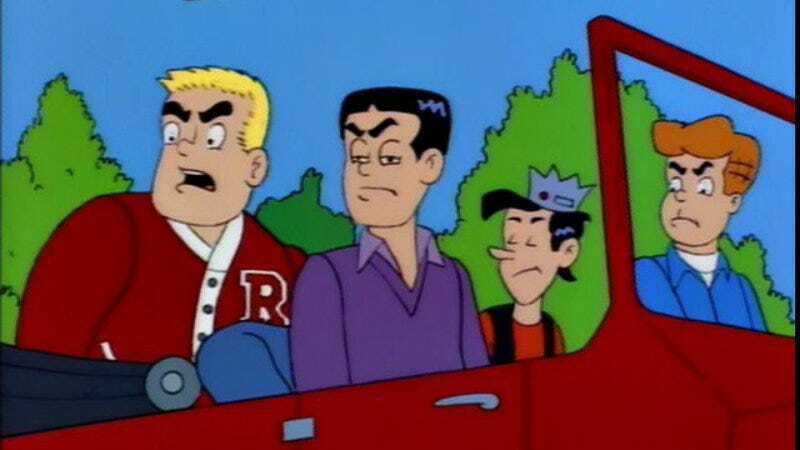 The old, old Reggie (center), on The Simpsons. Netflix’s decision to renew its suicide-focused teen drama 13 Reasons Why spelled bad news for The CW’s Archie show Riverdale; not because of any fears of copycat self-harm cropping up at Riverdale High, but because it meant the show’s Reggie, Ross Butler, would once again have his availability compromised by his commitments to the other show. (The character, normally Archie Andrews’ primary rival in the comics, was a minimal presence in the show’s first season largely due to Butler’s schedule.) Butler recently decided to leave The CW show, citing his expectation of 13 Reasons Why’s renewal as one of his own reasons why he’s for staying out of Riverdale as it moves into its second season. Now, Vulture reports that the show has cast its new Reggie, with actor and model Charles Melton stepping into the role. Melton’s a relative newcomer to TV; his only previous roles were as “Model” on an episode of Glee, and an appearance on American Horror Story. On the other hand, he has an active Instagram account in which he seems almost allergic to keeping his shirt on, which seems like a pretty ringing endorsement to taking on the part of Riverdale’s favorite muscly jerk.